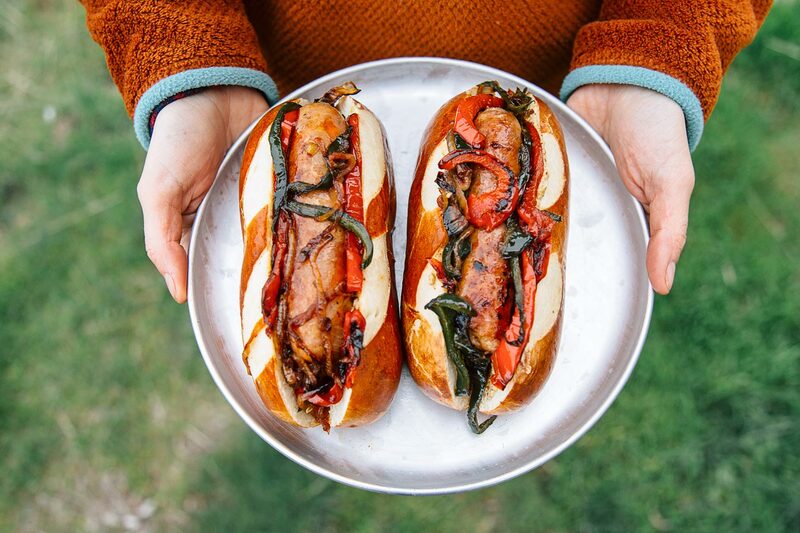 Get into the summer spirit with these pan-fried campfire brats with caramelized onions and peppers. 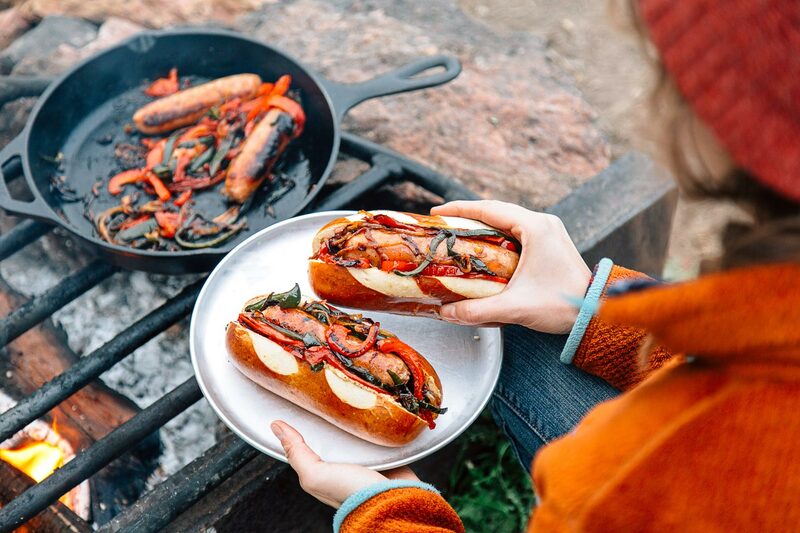 For many campers, grilling bratwursts over an open fire is a time-honored tradition. 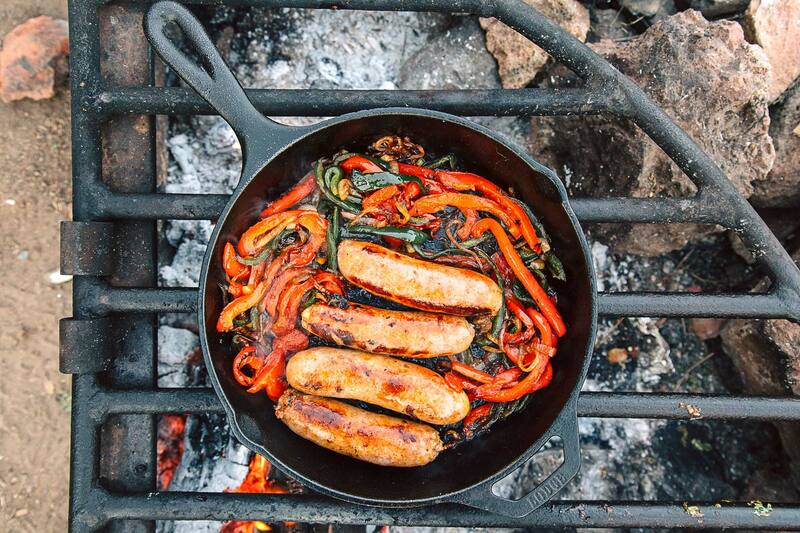 As a camping meal, brats are simple, easy, and unpretentiously delicious. But introduce a cast iron skillet into the mix, and you have the opportunity to transform this classic meal into something extraordinary. 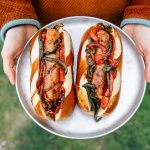 Toppings are a great way to elevate your bratwursts, and few are more sought after than caramelized onions and peppers. Cooking them over a campfire is an easy task. Just slice the peppers and onions thinly, toss in olive oil, and saute in a skillet placed on the grate over the fire. While red bell peppers are the most common choice, you can add some extra kick by using poblano, Anaheim or even jalapeño peppers instead. While some of these peppers might be too spicy to eat raw, when cooked down, they mellow out considerably (removing the seeds mellows them further). Cutting up a full onion and pepper might produce more veggies than you need. But thankfully your leftovers can have a second life the next morning. Just chop up the caramelized onions and peppers—as well as any leftover sausage—and stir into your eggs the next morning to create a flavorful breakfast scramble. 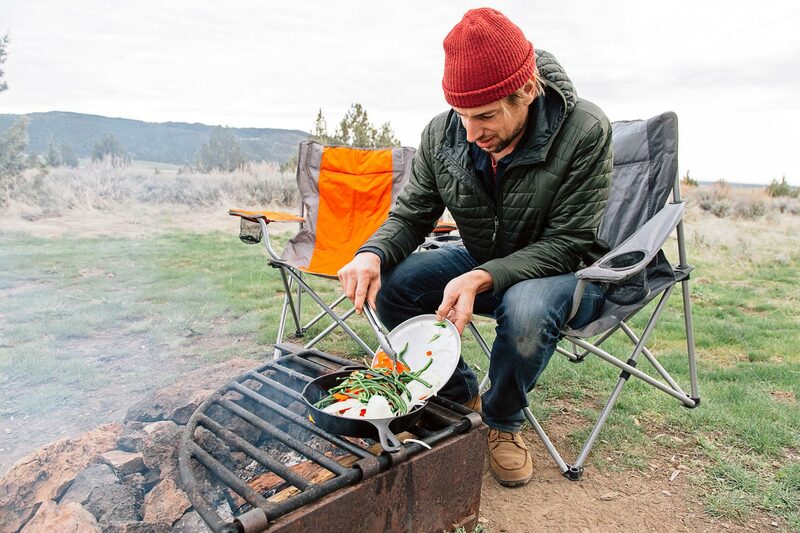 Preheat a cast iron skillet over medium heat on your campfire grate (or camp stove). Add the oil, then the onions, peppers, and salt. Cook for a few minutes until they just begin to soften, then add the bratwurst, nestling them into the vegetables so they come in contact with the skillet. Turn the brats and stir the vegetables occasionally, until the brats are cooked through (internal temp of 160°F), 15–20 minutes. Remove from the heat and divide the brats and veggies among the sandwich rolls. Top with mustard and enjoy! Crank up the spice with your choice of peppers. Bell peppers for no heat, poblano for moderate heat, jalapeños for high heat, or serrano peppers for extreme heat. Put the leftovers in a food storage container and place in a cooler overnight. Chop up in the brats and peppers in morning and mix with your eggs to make a delicious scramble.